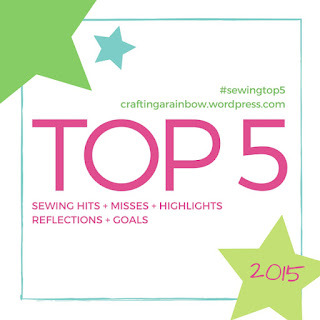 My Top 5 Misses for 2015 are more garments I just didn't wear versus the items not being well sewn. My life changed drastically in June and I made a couple of garments prior to starting my new job that just don't work for me now. This interview suit...I slaved over this suit and never wore it. Not once. You can read all about it's construction here. It's still in the closet because who knows when or if I will need another one but as of right now...I don't see wearing it in the foreseeable future. I regret using my black embroidered border fabric for this outfit. I've never worn the two pieces together and only recently wore the top over a pair of jeans...and wasn't really happy with it that way. Also the pants fit so-so, my pants pattern still needs some adjustments made to it and I've just been too lazy to get it done. This yellow ponte skirt. Why? Well I know why I made it - to match the sweater it's pictured with but this outfit just doesn't work in my new job. I've worn the complete outfit just once - to church this summer. The cardigan of course works with jeans and/or leggings so it's been worn a couple of times. The fruit fabric top and skirt. I've never worn the two pieces together. I've worn the skirt alone several times but the two pieces together just feel to dressed up for this job. Which is sad because I really like this outfit! The best part of this pic is that I can wear those white wedges again! Most of these looks ended up on this list because I made them prior to starting my new job. If I had waited a minute and scoped out the lay of the land better, several of these pieces would still be in the collection waiting for their time to shine. I know at the time I was discussing these changes that many people suggested that I "be me." However, one of the things that was said about me in a review recently was that I adapted to the culture of the company so quickly that it seemed like I fit in from day one. That was huge! Because the relaxed dress code is a big part of the company's culture! Can I share something else? I rarely wear my hair down now. It's either pulled back in a ponytail or up in an updo. Wearing my hair down adds to a dressed up feel in my clothing and when I say my office is casual I mean CASUAL! Another huge change for me because in my last job, I wore my hair down and styled 90% of the time! All of those changes will be a huge part of my next post on Reflections of 2015 and Goals for 2016. It will also be my last post prior to Christmas. I think we all end with with things that don't fit us one way or another. Thankfully it's not too many items. I absolutely love that suit and I'm thinking you could wear it to funerals or to church which is wear I wear the black suit I made for my 2009 SWAP. It's a shame you can't wear the fruit outfit because it's gorgeous but we all have pieces in our closets that hardly ever see the light of day. Happy Holidays, Carolyn. I find it really interesting that you say that some of these looks are too dressed up for your job. I work in a new place where the other two people in the department wear jeans and t-shirts. I... don't wear jeans. I wear skirts and sweaters or cardigans. I might be too dressed up for work, but I'm comfortable, and that really is what's most important - that you're comfortable in your clothing choices. The fruit outfit is cute. I would dress it down with flat sandals and minimal jewelry. I agree with dotted lines. Don't let any environment or people change your comfort level. People stopped telling me "I'm dressed up" because they relize that's my personal style. I dress according to how I feel and want to look. Sometimes I feel dressy and sometimes I feel casual. Besides the nature of NY (at least when I lived there) was all about fashion. I see what you mean about the last dress with the full skirt. It just looks wrong on you somehow even though it is beautifully made as usual. Oh I hope you wear the fruit fabric duo when you get a chance! I love that fabric! I agree with Leigh - can't wait to see 2016's sewing! That said, I love, love outfit #2 on you. It does look "dressy", I guess. But it's so pretty. Thanks for sharing so much with us - you're a true inspiration for me. I absolutely love the way you look in the last dress! You look Amazing! I think your misses are misses from your point of view fashion but they are great pieces of work worth to be kept. What a shame you did not like the McCall's dressent. It was such a fresh look and causal. I don't think that dress code counts that much in France at least it does not for me. So interesting. I was looking at my closet this weekend and realized I'm going to need an interview in (I'm going to start looking in the spring). And, my office is SO CASUAL now that I don't have anything but jeans and sweatshirt dresses to wear. I'll have to learn from you and plan carefully. This has been a very "thought provoking" post for me! Especially when it came to your ''interview suit"...I understand adapting to the "corporate environment" because that's been my life for over the last 40 years as an Executive Assistant. Newly retired this September, there will be a change in my clothing creations for 2016 too. It will be very interesting to see your new creations this coming year, as I may be using you as an inspiration!! Merry Christmas Ms. Carolyn!! I think maybe lots of people have to adjust, and it takes a bit of time. I cut out two wool skirts (Scotland) when I had already retired and didn't need them any more. My husband bought me a lovely executive type handbag, not needed any more, and so these things were never used. My most frequent mistake is to make things I want to wear, but have no place to wear them to. Skirts and jackets are not much needed at home! I'm loving these post, Carolyn! You know, you look really good in all those makes, but I'm with you - if you don't feel it yourself, then you can't wear it! How many outfits have I made that feel weird on me, or uncomfortable, or not my colour (in my opinion) that other people have loved on me? I figure I have to be the one who wears it, so I have to enjoy it!